Dr. Tatiana I. Samoylova received her MS degree in Botany and Zoology from Kiev National University (Kiev, USSR) in 1982 and her PhD in Biochemistry from the Institute of Experimental Botany (Minsk, USSR) in 1991. She was a postdoctoral research associate at the Department of Molecular Genetics (IPK, Institute of Plant Genetics and Crop Plant Research, Gatersleben, Germany) from 1994 to 1996. She moved to the United States to join the Scott-Ritchey Research Center (SRRC) at the Auburn University College of Veterinary Medicine (AUCVM) as a Postdoctoral Fellow. 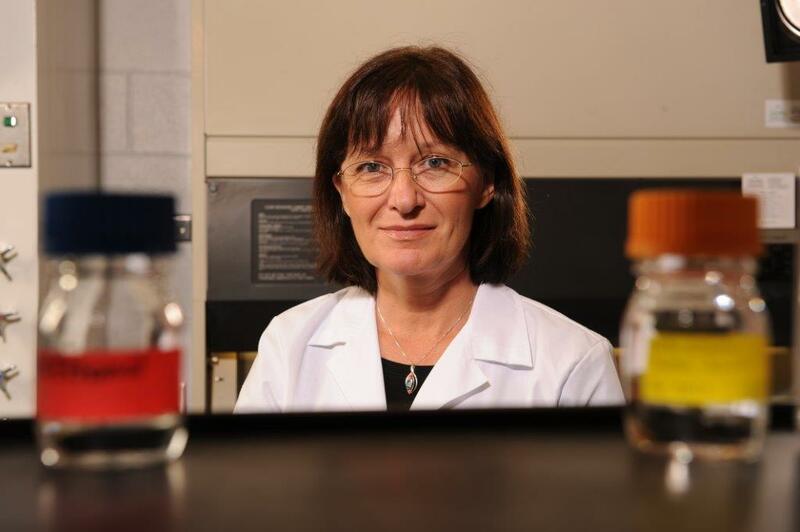 Dr. Samoylova currently holds joint appointments as a Research Professor at the SRRC and at the Department of Pathobiology, Auburn University, College of Veterinary Medicine. Dr. Samoylova is a protein/peptide biochemist with multiyear experience in phage display technology. Phage display is a powerful technique for identifying peptides or proteins that specifically recognize and bind to particular molecular targets. For more than 15 years, she has been applying phage display as a discovery tool for development of highly specific peptide-based diagnostic and therapeutic agents for numerous applications in human and veterinary medicine including cell targeting in genetic diseases, cancer and immunocontraception. Over the years, development of contraceptive vaccines for control of wild and feral animal populations has become Dr. Samoylova’s primary research interest and is currently the major focus of her laboratory. Immunocontraception is a promising strategy for animal population control. Similar to anti-disease vaccination, contraceptive vaccines stimulate the animal’s own immune system to produce antibodies which interfere with one or more events in fertilization. The focus of Dr. Samoylova’s laboratory is on development of contraceptive vaccines for wild and feral animals, including cats, dogs, and pigs, using phage as a vector for immunogenic peptides. Such contraceptive vaccines are composed of whole phage particles carrying immunogenic peptides, where the phage body plays the role of a carrier protein/adjuvant and multiple peptide copies stimulate production by the animal of anti-peptide antibodies. These antibodies interfere with male and female reproductive functions, leading to reduction in fertility. Examples of antigens used in Dr. Samoylova’s laboratory for vaccine construction include zona pellucida-binding peptides as well as molecules derived from reproductive hormones and their receptors. One of Dr. Samoylova’s projects is directed towards development of a novel type contraceptive vaccine for feral cats and stray dogs to be used as an alternative to surgical castration. A single dose, non-surgical sterilant that could be administered in the field at a reasonable cost would be an ideal solution, and would save lives and end suffering for millions of companion animals throughout the world. The goal is to create a vaccine that will fulfill these requirements. The vaccine is designed to include phage particles carrying multiple copies of gonadotropin releasing hormone (GnRH) peptides. Animals respond to such vaccines by producing anti-GnRH antibodies, which are known to affect fertility, reducing or preventing pregnancies. The project is funded by the Found Animals Foundation through Michelson Grants in Reproductive Biology. Other uses of such GnRH-based vaccines may be in the treatment of human and animal hormone-dependent reproductive cancers. Development of contraceptive vaccines for wild pigs is another major area of Dr. Samoylova’s research. Populations of wild pigs are rapidly expanding throughout the United States, causing annual losses of up to several billion dollars in damages to agriculture and other areas of the economy. Current control programs that focus on wild pig eradication through trapping and hunting are expensive, inefficient, and unacceptable for much of the public. Unlike any other contraceptive for wildlife, Dr. Samoylova’s approach allows development of vaccines that are species-specific. Species specificity is one of the major requirements for an ideal contraceptive for wildlife since such vaccines need to be distributed in uncontrolled environments where they could contact non-target species, resulting in unwanted loss of fertility in the non-target animals. The approach is unique and protected by two issued U.S. Patents. Potentially, it can be applied to population control of multiple wildlife species. This project is a part of a larger initiative by Auburn University that includes researchers from the College of Veterinary Medicine as well as School of Forestry and Wildlife. Samoylova TI, Braden TD, Spencer JA, Bartol FF. Immunocontraception: filamentous bacteriophage as a platform for vaccine development. Current Medicinal Chemistry, 2017, 24: 1-14. Samoylova TI, Ditchkoff SS, Bartol FF. Immunocontraception as a tool for population control of wild pigs. Alabama Wildlife, 2016, 80 (4):32-34. Samoylov AM, Napier ID, Morrison NE, Martin DR, Cox NR, Samoylova TI. Molecular cloning, sequencing, and distribution of feline GnRH receptor (GnRHR) and resequencing of canine GnRHR. Theriogenology. 2015 Jan 15;83(2):266-75. Samoylova T, Norris M, Samoylov AM, Cochran AM, Wolfe KG, Petrenko V, Cox NR. Infective and inactivated filamentous phage as carriers for immunogenic peptides. J Virol Methods, 2012, 183(1):63-68. Samoylov A, Cox N, Cochran A, Wolfe K, Donovan C, Kutzler M, Petrenko V, Baker H, Samoylova T. Generation and characterization of phage-GnRH chemical conjugates for potential use in cat and dog immunocontraception. Reproduction in Domestic Animals, 2012, 47 (Suppl. 6):406-411. Samoylova TI, Cochran AM, Samoylov AM, Schemera B, Breiteneicher AH, Ditchkoff SS, Petrenko VA, Cox NR. Phage display allows identification of zona pellucida-binding peptides with species-specific properties: novel approach for development of contraceptive vaccines for wildlife. J Biotechnology, 2012, 162(2-3):311-318. Samoylova TI, Cox NR, Cochran AM, Samoylov AM, Griffin B, Baker HJ. ZP-binding peptides identified via phage display stimulate production of anti-sperm antibodies in dogs. Anim Reprod Sci, 2010, 120(1-4):151-157. Samoylova TI, Cox NR. Phage display in brain tumor research. 2009. In: Contemporary trends in bacteriophage research, Adams HT (ed), Nova Science Publishers, New York, pp.237-248 (book chapter). Brigati J, Samoylova TI, Jayanna P, Petrenko V. 2008. Phage display for generating peptide reagents. Unit 18.9. In: Current Protocols in Protein Science (book chapter). Samoylova TI, Martin DR, Morrison NE, Hwang M, Cochran AM, Samoylov AM, Baker HJ, Cox NR. Generation and characterization of recombinant feline β-galactosidase for preclinical enzyme replacement therapy studies in GM1 gangliosidosis. Metabolic Brain Disease, 2008, 23(2):161-173. Selz KA, Samoylova TI, Samoylov AM, Vodyanoy VJ, Mandell AJ. Designing allosteric peptide ligands targeting a globular protein. Biopolymers, 2007, 85(1):38-59. Samoylova TI, Morrison NE, Globa LP, Cox NR. Peptide phage display: opportunities for development of personalized anti-cancer strategies. Anti-Cancer Agents – Medicinal Chemistry, 2006, 6(1):9-17. Samoylov A, Samoylova T, Pustovyy O, Samoylov AA, Toivio-Kinnucan M, Morrison N, Globa L, Gale W, Vodyanoy V. Novel metal clusters isolated from blood are lethal to cancer cells. Cells, Tissues & Organs, 2005, 179(3):115-124. Mount J, Samoylova T, Morrison N, Cox N, Baker H, Petrenko V. Cell targeted phagemid rescued by pre-selected landscape phage. Gene, 2004, 41:59-65. Samoylova TI, Cox NR, Morrison NE, Globa LP, Romanov V, Baker HJ, Petrenko VA. Phage matrix for isolation of glioma cell-membrane proteins. BioTechniques, 2004, 37(2):254-260. Samoylova TI, Petrenko VA, Morrison NE, Globa LP, Baker HJ, Cox NR. Phage probes for malignant glial cells. Molecular Cancer Therapeutics, 2003, 2:1129-1137. Samoylova TI, Morrison NE, Cox NR. Molecular markers of glial tumors: current targeting strategies. Current Medicinal Chemistry, 2003, 10: 1241-1253. Samoylova TI, Smith BF. 2002. Identification of cell targeting ligands using random peptide-presenting phage libraries. In: Genetic Library Construction and Screening. Advanced Techniques and Applications. Bird C, Smith BF (eds), Springer-Verlag, Heidelberg, pp.209-231 (book chapter). Samoylov A, Samoylova T, Hartell M, Pathirana S, Smith B, Vodyanoy V. Recognition of cell-specific binding of phage display derived peptides using an acoustic wave sensor. Biomolecular Engineering, 2002, 18: 269-272. Samoylov AM, Samoylova TI, Globa LP, Vodyanoy V. Peptide biosensor for recognition of cross-species cell surface markers. J Molecular Recognition, 2002, 15:197-203. Samoylova TI, Ahmed BY, Vodyanoy V, Morrison NE, Samoylov AM, Globa LP, Baker HJ, Cox NR. Targeting peptides for microglia identified via phage display. J NeuroImmunology, 2002, 127:13-21. Samoylova TI, Cox NR, Samoylov AM, Cochran AM, Petrenko VA. Phage constructs, sequences and antigenic compositions for immunocontraception of animals. Issued 10/28/2014. U.S. Patent No. 8,871,901. Samoylova TI, Baker HJ, Cox NR, Ditchkoff SS, Van Kampen K. Zona pellucida binding peptides for species-specific immunocontraception of animals. Issued 07/23/2013. U.S. Patent No. 8,492,516. Samoylova TI, Baker HJ, Cox NR, Ditchkoff SS. Methods of identifying peptides and compositions that bind to oocytes in a species-specific manner. Issued 04/17/2012. U.S. Patent No. 8,158,366. Samoylova TI, Baker HJ, Griffin B, Pendergrass K, Globa LP, Givens MD, Riddell KP, Cox NR. Methods for identifying peptides that bind to intact oocytes. Issued 11/15/2011. U.S. Patent No. 8,057,992. Samoylova TI, Baker HJ, Cox NR, Globa LP, Morrison NE. Methods for targeting and killing glioma cells. Issued 01/05/2010. U.S. Patent No. 7,642,063. Vodyanoy VJ, Samoylov AM, Samoylova TI, Pathrirana ST. Ligand sensor devices and uses thereof. Issued 11/21/2006. U.S. Patent No. 7,138,238. Samoylova TI, Petrenko VA, Cox NR, Morrison NE, Baker HJ, Globa LP. Peptides for recognition and targeting of glial cell tumors. Issued 08/22/2006. U.S. Patent No. 7,094,868. Smith BF, Samoylova TI, Baker HJ. Methods and compositions for targeting compounds to the central nervous system. Issued 06/04/2002. U.S. Patent No. 6,399,575. Smith BF, Samoylova TI. Methods and compositions for targeting compounds to muscle. Issued 12/11/2001. U.S. Patent No. 6,329,501.